She got into it because she has four daughters. They are grown now, but they used to participate in a lot of pageants. And people around town would always ask to borrow the dresses for dances. So, Dena thought, maybe I can start something so that other girls can borrow the dresses for an affordable price. But mainly she wanted young women to be able to have modest options. Dena's husband suggested she go to a dress auction in Salt Lake City. Which, she did. She bought several dresses at auction to add to the collection. Many of the dresses didn't meet the modest standard so she has a hobby, in modifying those dresses so that they will not be backless or sleeveless, but can also be modest. Most of the dresses that I saw where pageant worthy. Lots of bright colored dresses with beading on the bodice and full skirts below. My sister was there again to try on a dress for a black tie event to attend with her husband. So, not all of the dresses were so youthful. My sister was able to find an elegant grown up dress. This was one of her concerns. She didn't want to look like a teenager. 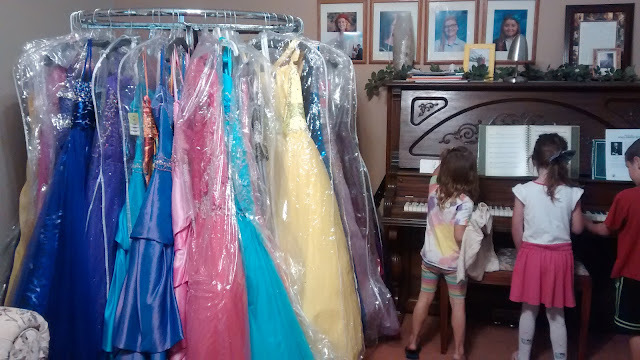 Comparing this dress rental option to the one I reviewed last week: Ooh La La Dress Rentals, this shop is much more affordable and has more modest options. But personally, I really like the sheer variety of dresses from Ooh La La better. Ooh La La has about 700 dresses in her collection. Suzy's Closet has about 170 dresses. So there was a difference. Suzy's Closet also does alterations, so if you find a dress else where that you love, she can alter it for you... And she had a handful of wedding dresses for sale as well. Also, Dena will make minor alterations on dresses in her own collection to fit the wearer, like taking it in, so that it can be undone again. You can see more about Suzy's Closet on her Facebook page here. And I am sure her photos capture her collection better than mine - I only saw them hanging on displays in the living room. Oh, one last thing that I really liked at Suzy's Closet. 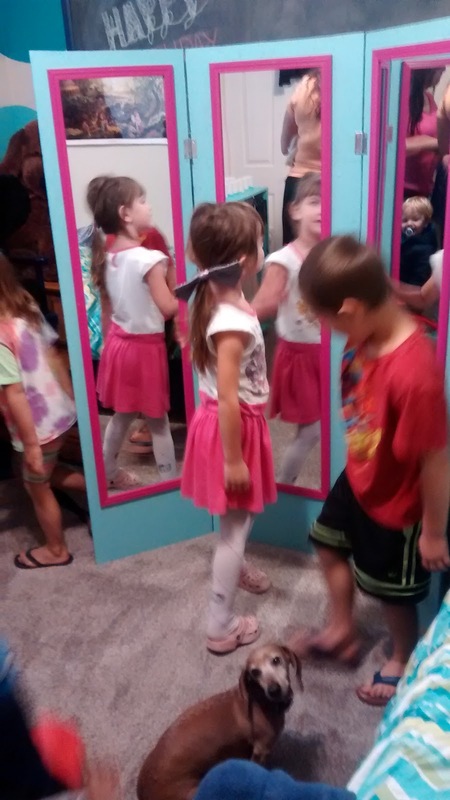 She had a binder with a picture of every dress in her collection. That was a nice way to thumb through the collection quickly and find a dress you like. 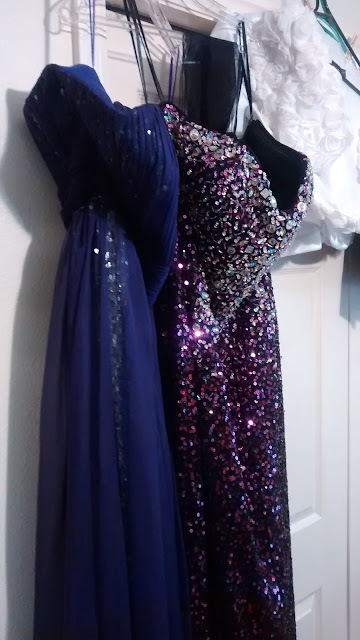 Some dresses my sister tried on. Totally, forgot to mention this in my review, but we could bring children to the appointment. The kids could play in the yard which was fully fenced in. but they are in protective plastic covers. 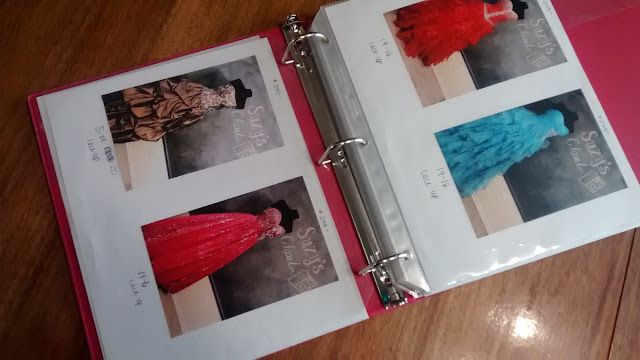 Binder with all the photos of every dress in her collection. Dena was really sweet, didn't mind our kids at all playing the piano. This was just one rack of clothes. There were more in another room.